Bathtub liners - What is a tub liner? Bathtub liners are sheets of PVC plastic or acrylic which are molded to the shape of a tub, placed over your existing tub, and then glued down to cover it up. Bathtub liners are simply acrylic covers that require you to trade the deep gloss of a restored porcelain tub for the look and feel of plastic. Bathtub liners - How do bathtub liners compare to bathtub refinishing? Bathtub liners are often marketed as a better alternative to refinishing. However, liners may not be your best option when you consider all of the problems with liners. Bathtub liners are more expensive. The average acrylic bathtub liner installation costs $2,600 and if you add a wall system, soap dishes, etc, the cost can go as high as $6000! The cost to have All Boro Refinishing will refinish your bathtub to like new look and feel ranges in the hundreds not Thousands depending on the location and condition. 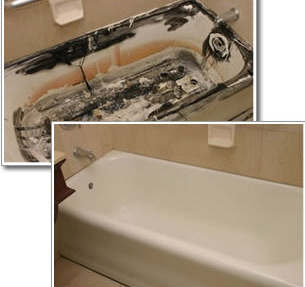 Refinishing is often 70% to 80% cheaper than bathtub liners! Bathtub liners take longer than one day. Bathtub liners take several weeks from measuring and ordering to actual installation. Here's the typical process. 2. If the salesman can't, an installer then comes to your home to measure your tub. Bathtub liners require a licensed plumber. Bathtub liners can develop leaks...leading to mold and mildew. Bathtub liners suffer a bad reputation for allowing water to leak between the old tub and the new liner. Any small crack or hole which develops in the caulking along the seam between the liner and the vertical wall surround can allow water to penetrate and build up between the liner and the old tub. Water can also leak around the drain or overflow joints. If water does leak and get trapped between the liner and the tub, the water is almost impossible to remove. The result can be a "squishy" feeling each time someone steps in and out of the tub. Not only can the misplaced water create a "squishy" feeling, worse yet, the standing water can become stagnant, creating obnoxious odor problems. Stagnant moisture can lead to unhealthy mold and mildew build up. Bathtub liners can be difficult to replace. Bathtub liners eventually wear out and have to be replaced. Since liners are glued to the old tub when installed, they usually have to be ripped or cut out in order to replace them. Bathtub liners or inserts can crack. Bathtub liners come in a limited color selection. If you want to compare the cost of refinishing to the installation of a bathtub liner, call our toll free number, 1-800-925-2280 to reach the nearest Best Bathtub Refinishing professional.